This article will take you on a quick tour of our Drag & Drop Editor for Gator Survey. This editor is very similar to our Drag & Drop editor for Gator Creator, with slightly different features to cater for survey related questions.. 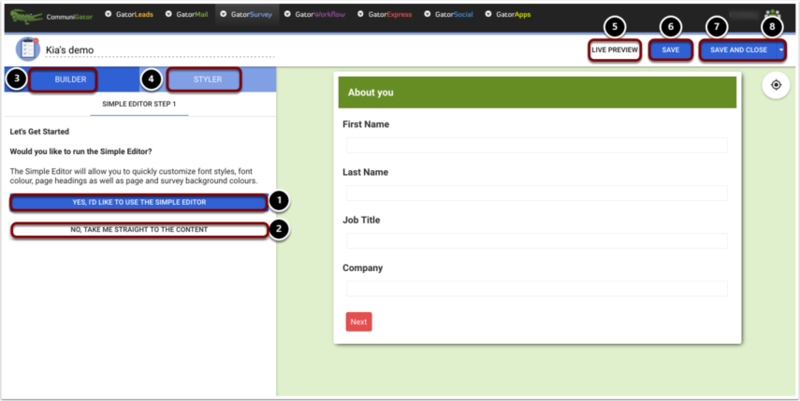 Create New Survey - This will launch you into the Drag & Drop Editor. 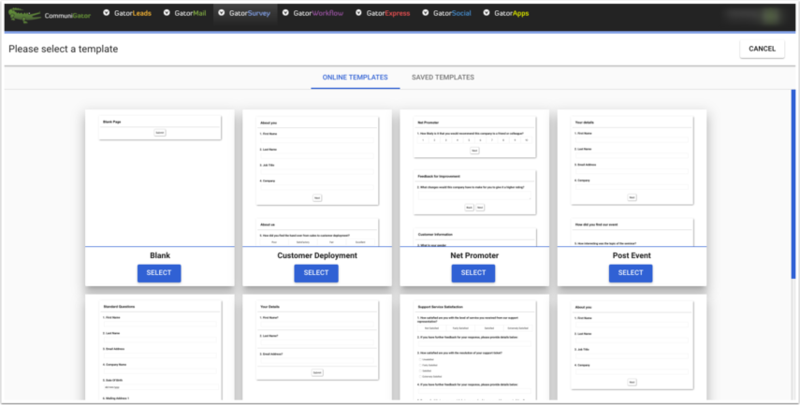 Style Templates - you will find your custom templates in this area. Survey List - You'll see all your surveys, regardless of their status, in this list. Click on a surveys name to launch the editor. These icons are clickable and allow you to preview, duplicate, publish, see past results, and delete. 1. Select from a blank survey or if you need inspiration, use the question templates displayed. 2. 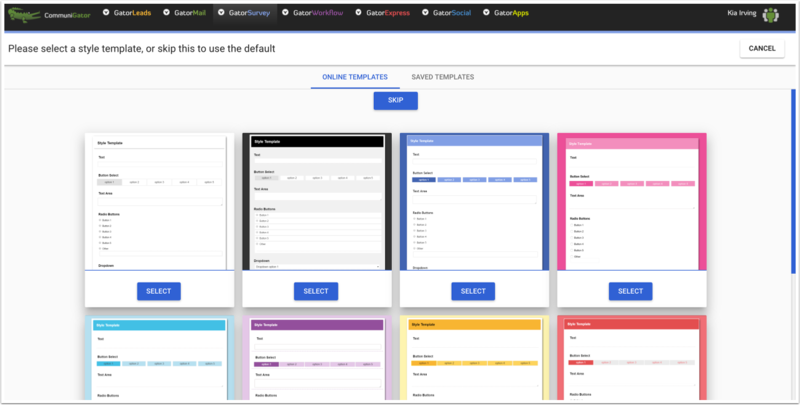 Select a style template from the selection. Please Note: You can edit the colours in the next screen if you'd prefer. 'Yes, I'd like to use the simple editor' to tweak the style of the template. 'No, take me straight to the content' but you can make changes after this point! Builder - will give you all the survey questions, pages, and other options. Styler - you can amend any of the template style from here. 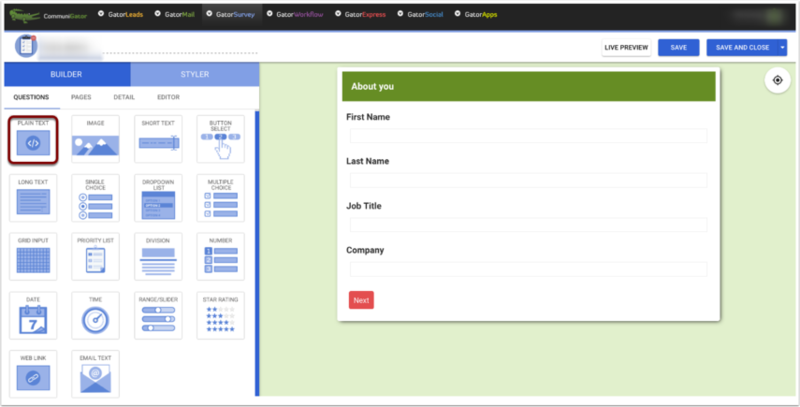 Live Preview - preview how your survey is looking at any point of your build process. Save and Close - to exit. Down Arrow - save to templates. Here you can drag any of the question options from the menu on the left to the canvas area. 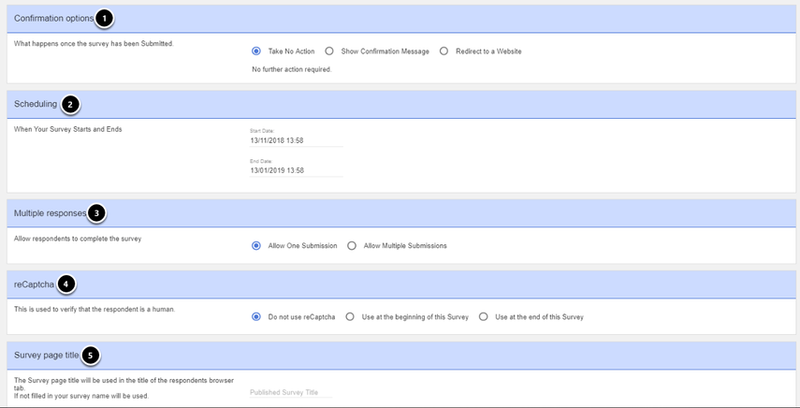 When you're ready to publish your survey, click the publish button on the main survey screen, as shown in step 1 of this guide. Test your survey - Use the link here to test the survey. When you're ready, click 'Launch'. Quick Share - Here are some quick and easy ways to get your survey out there. From using the direct link, to GatorMail, social media, and options to iframe to your website (shown below). Please Note: When testing a survey, your results will not be recorded. This is to prevent any anomalous results from appearing in your official results.